In our previous Blog, we had highlighted various challenges that manufacturers face with respect to controlling and managing their Inventory. Taking the discussion further, we explain how you can tame the magnanimous and the most critical aspect of your manufacturing operations by utilizing the right features of an Enterprise Resource Planning (ERP) software. An ERP along with other associated technologies can easily solve your inventory problems and help you reap immense benefits for your manufacturing organization. Imagine a scenario where all the goods that enter your facility are tracked till it leaves the facility as a finished product and reaches your customer. Goods here means, raw materials, semi-finished parts, assembly parts etc. whatever is deemed necessary to create a full-fledged product. You can completely automate inventory management with the help of various tracking technologies such as Bar-code and RFID. Here’s how it would work. All incoming raw materials, parts, assemblies are tagged with bar-codes or RFID tags and product information is instantly recorded in the ERP. The bar code labels are generated using an in-built report writer in the ERP or with the help of third-party bar code applications. Bar code technology can be integrated with hand-held printers and scanners that enables personnel to instantly record vital product information into the ERP from anywhere, anytime. This ensures that you have a ready count of how much materials you have in hand and that enables you to seamlessly schedule your jobs, and accurately arrive at job costs. Now, these goods can be tracked at every production phase and recorded into the ERP. The entire movement of the material, from its procurement till it assimilates into a finished product can be monitored. This improves product traceability and in case of mass product recalls due to a defect, the issue can be quickly and easily traced back to the defective product batch. An ERP aids in comprehensive supply chain collaboration as it can record and track inventory location to the right bin where the necessary material is kept. Warehouse management is a breeze as you can maintain a master inventory list that would include warehouse information, procurement details, shipping information, quality hold, work center and vendor information. An ERP can be easily integrated with third-party shipping and logistics applications. Customer shipments can be easily tracked till it reaches the customer. Maintaining the right inventory level at all times is a challenge all manufacturers face. 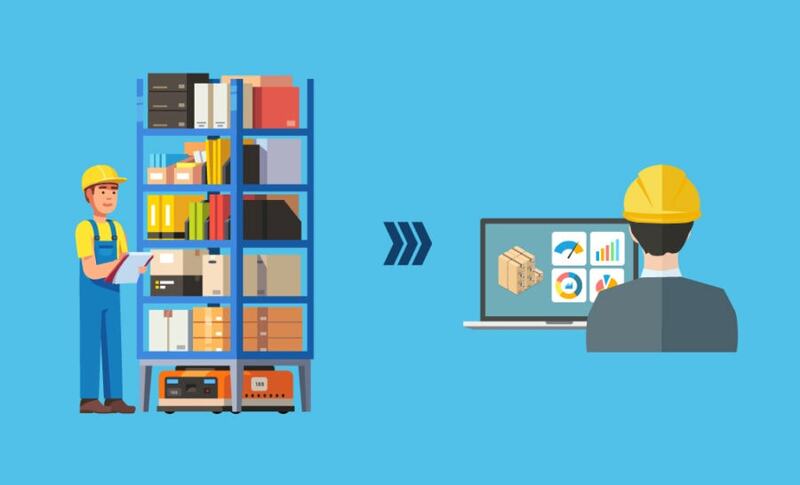 An ERP not only helps you maintain the right inventory level but also ensures that its replenished right on time to reduce job scheduling delays. Every time the stock levels deplete below a certain threshold, the ERP sends automated alerts to the personnel who can then initiate a purchase order with the nearest supplier. Recent technological advancement ensures that ERP automatically places a purchase order with the supplier if the available inventory levels aren’t matching the current order requirements. Auto inventory reorder prevent stockouts of parts and raw materials, thereby making job scheduling and production more efficient and cost effective. Emergency procurement of materials become a thing of the past, reducing costs and increasing your margins. ERP also lets you categorize and track parts and materials in a manner that fits your production processes. It also saves time and reduces data entry errors by eliminating the need for multiple data entry. Most important from a business management standpoint, you always know what your inventory costs, when you bought it, and why. You make better business decisions while lowering inventory costs, tracking inventory with near-100% accuracy, and a running a shop floor that doesn’t suffer delays due to part or materials shortages. ERP lets you easily reconcile physical inventory counts with system inventory records. This is done using cycle count or full inventory methods with the help of bar codes and other tracking technology. This helps manufacturers to get to an accurate view of their inventory levels and prevent under or over stocking at all times. ERP software consists of Material Requirement Planning (MRP) and Master Production Schedule (MPS) that is integrated with Inventory Management. Based on the number of orders in hand, the MRP module ensures adequate raw materials required to initiate production and fulfil the orders. It eliminates over-stock by constantly monitoring inventory levels and thereby reducing procurement and storage costs. The MPS works in conjunction with MRP by aptly scheduling production based on material availability, thereby reducing production disruption, material wastage, job delays etc. An ERP automates Inventory Management by reducing multiple data entry points and ensuring optimum data accuracy. As a manufacturer, you will know the costs associated with each inventory procurement along with the reasons why. Quick, calculated decisions are made based on the inventory levels, costs are reduced, and job delays due to material shortages are a thing of the past.